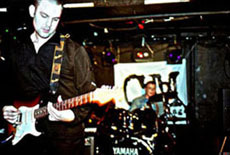 Monomania is the latest band to come from Manchester, England who has generated quite a buzz. Will they be the next “big thing” to come from England? I don’t know, I’ve been wrong before. But, I think Monomania has a good fighting chance. They’ve got catchy, quality material, a great attitude and good press so far. I talked to Monomania leader Ricky about what exactly makes the band tick. Go to their website, download their mp3’s and judge for yourself. E.C. : The music scene in England is vastly different from America. Tell me about the current music scene in the U.K. and how Monomania fits in? Ricky Monomania: Monomania are one of those rare acts that actually could go over to Do well in the U.S. The web-mp3 files have been downloaded equally by Americans as well as Europeans. The U.S Monomania fans like the power and Britishness. They like to hear the Northern accent - it seems to appeal to them. As a live act we have a big sound and a technically sound which is also important when trying to win over a U.S live audience. So, I see Monomania as being successful at home and abroad. Recently "the Net" magazine said Monomania where one of the ten best British up and coming artists. E.C. : Some of your songs (but not all), remind me of the Stone Roses. We're the various Manchester bands your greatest influences, or are there others? Ricky Monomania: Monomania are influenced by the City we live in rather than any one Band in particular. The City has been buzzing for the last few years and that energy has rubbed of on us. I think Monomania are influenced lyrically by the likes of Mark E Smith (The Fall) and David Gedge (Wedding Present) and also we've worked with producers who worked with the likes of Stone Roses in the 80's and 90's in the very same studios they recorded releases in. There are bound to be production similarities in our recorded material which was nice. E.C. : How would YOU describe the music of Monomania? Ricky Monomania: Monomania music is Quirky, Lively and Catchy. We are alternative but write commercial songs as well. We have been compared to many dark intense alternative acts but we also have a very light hearted honest at times risqué lyrical side. E.C. : Who came up with the name, "Monomania" and what does it mean? Ricky Monomania: I came up with the name Monomania. It means a manic obsession with one thing in particular. With mine being music and being the founder member of the band I decided that was suitable. E.C. : The three Monomania mp3 tracks on the vitaminic website have really whetted my appetite to hear more from the band. When can we expect a full-blown album? Or are you waiting for a record deal? Ricky Monomania: We release our debut single on Uglyman Records www.ugly-man.co.uk in June. Uglyman of course brought "Elbow" & "I am Kloot" to the attention of the industry and music listeners and they'll do the same for us, I am confident of that. Our whole set is very consistent and we will put out a classic debut LP. E.C. : Speaking of which, how important is "getting signed to a major label" to the band? Has there been any interest in the band from the major labels? Ricky Monomania: There has been interest but to be honest we want a label that will Give us some freedom on creative matters such as artwork etc., which is important. We need a label which will basically get our music in the shops. We have 100's of interested internet contacts who would rush out and buy our material, if it was easily accessible. E.C. : Tell me about your live schedule? Do you guys tour regularly in the U.K.? Any plans to ever play the States? E.C. : Finally, what is the ultimate goal for Monomania? Ricky Monomania: The ultimate goal for Monomania is firstly to carry on learning and getting better all the time and putting out quality records and regular LP's for at least the nest 10 years home & abroad.